Tour Scotland photographs and videos from my tours of Scotland. Photography and videography, both old and new, from beautiful Scotland, Scottish castles, seascapes, rivers, islands, landscapes, standing stones, lochs and glens. 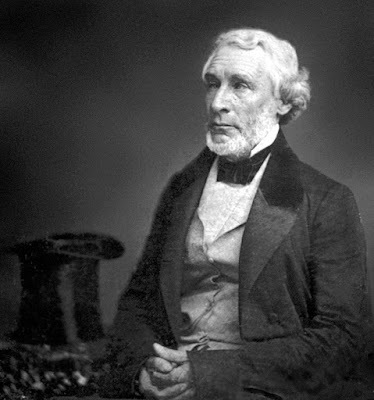 Old photograph of James Gordon Bennett, who was born on September 1, 1795, to a prosperous Roman Catholic family in Newmill, Banffshire, Scotland. At age 15, Bennett entered the Roman Catholic seminary in Aberdeen, where he remained for four years. After leaving the seminary, he read voraciously on his own and traveled throughout Scotland. In 1819, he joined a friend who was sailing to North America. After four weeks they landed in Halifax, Nova Scotia, where Bennett briefly worked as a schoolmaster till he had enough money to sail south to Portland, Maine, where he again taught school in the village of Addison, moving on to Boston, Massachusetts by New Year's Day, 1820. He worked in New England as a proofreader and bookseller before the Charleston Courier in Charleston, South Carolina hired him to translate Spanish language news reports, so he briefly relocated to The South. He moved back north to New York City in 1823, where he worked first as a freelance paper writer and, then, assistant editor of the New York Courier and Enquirer, one of the oldest newspapers in the city. He eventually became the founder, editor and publisher of the New York Herald and a major figure in the history of American newspapers. He died in Manhattan, New York City, on June 1, 1872. All photographs are copyright of Sandy Stevenson, Tour Scotland, and may not be used without permission. View the most recent Tour Scotland photographs. Tour Scotland travel video Blog of the Caledonian Canal at the South entrance to Loch Ness in the Scottish Highlands of Scotland. The canal runs some 60 miles from northeast to southwest. Only one third of the entire length is man made, the rest being formed by Loch Dochfour, Loch Ness, Loch Oich, and Loch Lochy. These lochs are located in the Great Glen, on a geological fault in the Earth's crust. Tour Scotland travel video Blog of the ferry from Mallaig going over the sea to Armadale, Scottish Gaelic: Armadale, near the southern end of the Sleat Peninsula on the Isle Of Skye, Inner Hebrides, Scotland. Tour Scotland travel video Blog of Skye Bridge, Scottish Gaelic: Drochaid an Eilein Sgitheanaich, a road bridge over Loch Alsh, to Isle Of Skye, Inner Hebrides, Scotland. The Isle of Skye is connected to the mainland by this road bridge. Connecting the mainland village of Kyle of Lochalsh to the village of Kyleakin on Skye. The main bridge is a concrete arch, supported by two piers. This connects Skye to the small island called Eilean Bàn which has a lighthouse just below the bridge. The the rest of the bridge is level across to the mainland. The total distance across is 1.5 miles The main arch is about 35 metres high, a 30 metre clearance for boats at high tide.